Exploded drawing shows internal components and their relationship with the stern drive unit. 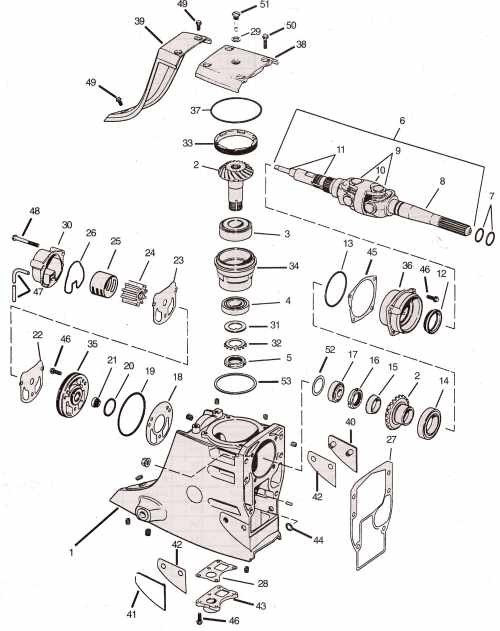 Detailed step by step OMC stern drive illustrations will aid making repairs to your outdrive. If help is required, contact our service tech for help with your stern drive repair at (416) 751-7326. Please have horsepower and year of stern drive boat ready when calling. You can print 3 or 4 pages to have your own upper gearcase list. This bearing is often the 1st bearing in upper OMC Cobra gearcase to seize up in upper gearcase do to being run with low or no oil. The supporting bearing carrier is also damaged in most cases do to bearing outside race being spun in the aluminum. Please phone to contact order desk if you would like to receive this unit with the yoke drive shaft not joined to the yoke as per-load would be hard to judge with unit complete. Note water pump shaft is often bent if gears lock up. Best to check with dial indicator before unit is taken apart. Wear plate, 89950 Impeller, 12391 pump, 86630 seal and pump housing including the 34770 Gasket. Note unit is included in water pump kit. Many of the above parts will require the use of 680 Loctite for oil seals and OMC / Johnson / Evinrude gasket retainer compound for use on all o rings and gaskets.